I have observed that the Hamilton watches with American-made movements are usually in higher-end watches while the Swiss-made movement models were, generally, less expensive. For example, American-made watches will typically have sterling silver dials with solid gold markers while the Swiss-based movements have embossed dials. American-watches often have gold filled or solid gold cases and Swiss models have rolled gold plated cases. 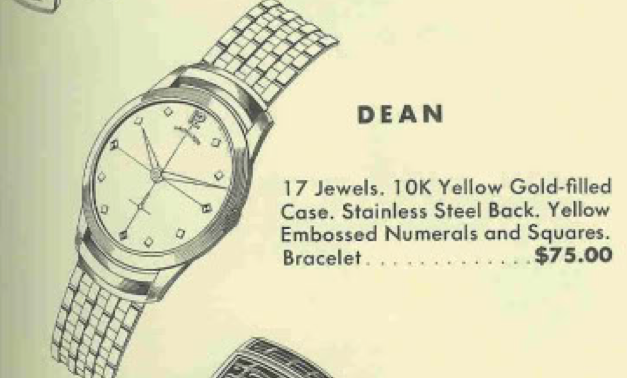 Of course, there are exceptions to every rule and one of them is the 1957 Dean. It was produced though 1960. It has an American-made 730 movement but also has an embossed dial - probably to keep the price point down and compete with foreign imports. The Dean was introduced with a bracelet as shown above or strap. 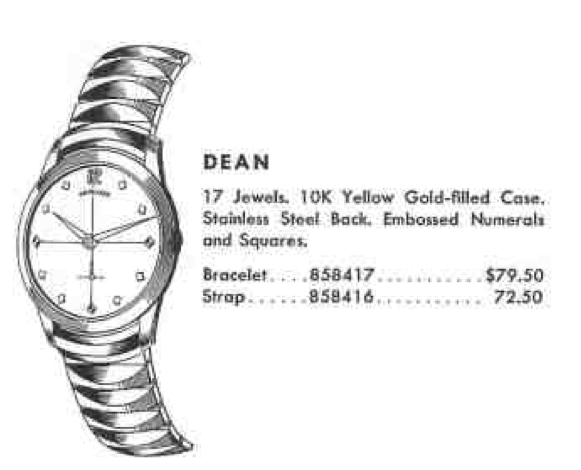 In 1959, the Dean was outfitted with a different bracelet and no strap option was offered. As I said above, under the hood of the Dean you will find an 8/0 sized, 17 jewel 730 movement, made in Lancaster, PA.
My Dean project watch arrived in decent shape. It has a replacement Speidel bracelet that has worn into the lugs a little - so it will have to go. Other than that, it really just needs a good cleaning. The case on the Dean is interesting and it's hard to tell if it is a front-loader that opens through the crystal or if the back will pop off. I can see some tool marks on the side opposite the crown so I suspect the back will pop off. The 730 movement is just like the one I did yesterday with the Amherst. The dial is in very nice shape. It's been refinished but it's been done nicely… the lines line up with the markers well and everything is centered nicely. The movement is cleaned and oiled and after a little tweaking to the regulator, the timing comes right in line. The finished project turned out great I think. The dial cleaned up well and paired with a new black lizard strap - this watch looks sharp. I have a watch just like this that was my father's confirmation watch in 1957. I wear it often. Does it have any value? His has a brown leather band but otherwise is exactly like this watch. Being your father's it should be priceless. But it you had to insure it I would say $250 would be good. It's value to sell would depend on its condition and service history. Thank you very much!!! I have always been afraid to wear it as I thought maybe it was worth too much. $250 is wearable so I am very grateful, thank you. Most days I wear my Grandfather's old everyday watch which is an old Waltham wind up but like I said I was always afraid to wear the Hamilton because it seems too nice. I feel much better about wearing it now. "A Tale of Two Winslows"